Take 1 capsule daily, preferably with a meal. In order to achieve the best possible results, regular supplementation for at least 2 months is recommended. In order to achieve the fullness of benefits resulting from biotin supplementation, the preparation should be taken at 2-3 hour intervals from the last meal being the source of raw egg, as avidin contained in raw eggs contributes to permanent biotin binding, which weakens its absorption. Apart from this, the problem may also be solved by thermal processing contributing to avidin denaturation. The absorption of biotin is also influenced by proper supply of the remaining vitamins from the group B as well as manganese and magnesium. 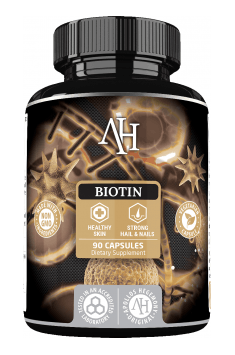 Supplementation with biotin is extremely effective and the benefits resulting from using it are noticeable quite quickly. However, it is worth remembering that for its influence on nail plate one needs to wait even up to 6 months. It is related to slow growth of nails. The optimal dose of biotin positively influencing the condition of hair and nails is around 2,5 mg a day. In case of the therapy of lipid profile, diabetes and neuronal disorders related to it, higher effectiveness is caused by the dose of 9-16 mg daily.